The January issue of "Total Politics" magazine is now out for sale, with my photograph of Caroline Lucas on the cover and more featuring inside with her interview. I shot the leader of the Green Party inside Portcullis House at Westminster. As usual with a very busy MP, we have a bit of time to set up backdrop and lighting in a little area and then only few moments to shoot their portraits. 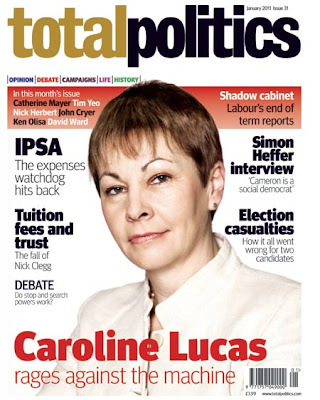 Caroline Lucas was extremely nice and after taking her portrait we wandered around Portcullis House to take some more natural images and show Total Politics readers a bit more of the settings - strangely in between indoor garden, modern office and classic decor. The cover design is by Antonello Sticca, currently working on a cool redesign for the whole mag!